As you know, we have written a great deal about the project to convert 4th Street in Losangeles's Mid-Wilshire area into a bicycle boulevard. 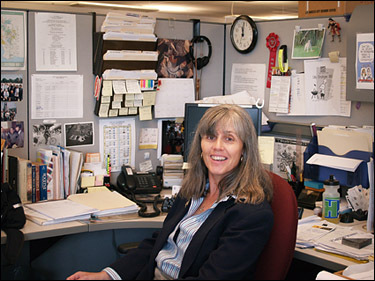 It was local advocate Ingrid Petersen who first proposed the idea in her 4SBB.com website (no longer extant). 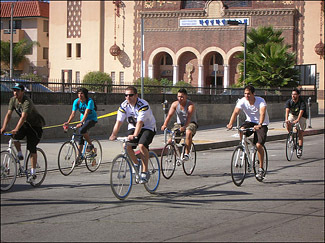 In recent years, the Los Angeles County Bicycle Coalition has been not only promoting the concept but doing much of the legwork necessary before the city can actually make the physical changes that would transform the street from a pleasant residential road with a bit too much speeding cut-through traffic to a street that would be quieter, more neighborly, and safer for residents while also serving as a comfortable through route from midtown to the near west side for cyclists. But it is LA's much-maligned DOT that would have to do the heavy lifting were the project approved and financed, as it probably will be. With that in mind, we interview Michelle Mowery, LADOT's Bicycle Project Coordinator, about 4th Street, bicycle bouelvards, and riding in the streets of Los Angeles. How long has Fourth Street been an official bike route? Yeah, so history repeats itself. But it basically called out some corridors. It wasn't very effective in that we didn't get a lot of bike lanes out of it, and it wasn't enforced, but what did come out of it was a lot of bicycle routes. And a lot of our old bicycle routes were put in in the late 1970s as a result of that plan. In the '96 plan we really started looking at arterials for bicycle lanes around the city, as we are with the new plan today. I ride 4th street almost every day. Uh-huh. Lots of folks do. Yeah. My eyeball count shows that there are times when there are an awful lot of users, especially at rush hour, carrying little bags and looking like they are going to work. A really high proportion of women compared to statistics. Very much so. You are absolutely right. The worst part of 4th street runs through one of the wealthiest neighborhoods in Los Angeles, It runs right in front of the Japanese consul's house where there are always functions. It is right where the giant potholes in the "Hudson River" are. So I've called BOSS literally six times myself and they patched it. At first the patch would last 4 or 5 months. Lately it hasn't even lasted two months. The cars hit it and it is all out. Is there any way for bikeways to have, if not actual authority, at least influence over these matters to coordinate some kind of treatment like a french drain there. If they can't let the water drain directly to the storm drain that is right under the street, which seems to me to be an ideal solution, at least have one of those channels so that it doesn't puddle, doesn't undermine the street. I know really competent riders that go on 6th with all its traffic because they just can't handle all the potholes and the longitudinal ridges, perfect wheel catchers. In many ways, especially at night, it is quite a dangerous street. When they did begin the repaving of 4th street, they began at the end that had almost no damage. Because it is a bike route, it in a way is your baby. You have to make it a safe bike route and you have to make it an attractive bike route. Right. In the new plan one of the things in here is a higher standard of maintenance for bicycle facilities, and I can cite that... [thumbs through paper] So I can say that the new plan is going to do this. Well, some of this plan I think I worked on with Bike Writers collective in choosing the backbone routes and all that. There are issues about the bike backbone network, but most of the streets were already in the document before that came out. So... it is what it is. But we just want to make sure we can get everybody's needs and wants addressed. I mean, we won't get to every street in the city--at least not this time around. There is no question that at least 400 miles of this are going to be really hard, and that the city is going to have to make hard choices about how they are using the streets. I think DOT is slowly making the change. Instead of just resisting and say[ing] that we have congestion problems. If the council offices say yeah we want do this and we want to make the change here, DOT will facilitate that change. Pulling back a little bit in perspective, there is plenty of evidence from other cities that road diets actually ease congestion. When I was in Portland car traffic was not horrendous, you know. And even though there were lanes that were exclusive to busses and lanes that were exclusive to bikes--some streets were exclusive to bikes and busses only--car traffic moved very smoothly. You know, you're preaching to the choir. I'm an advocate for change. The air quality issues drive a lot of the decisions here. And unfortunately the mind set is then we have got to have more lanes and we have to have more width. Not, we need to look at other modes and make the system more efficient, and recognize that we have got a lot of roadway space out there that we are not using as efficiently as we can. And hopefully some of that mindset is changing. I'm just beginning to see the beginnings of that. The "street paving schedule." That also seems rather whimsical. The street my son lives on has been paved three times in the last 20 years, and Sunset has just been repaved for the first time in 75. I don't know exactly how those decisions are made. I do know that the council offices have some authority to determine what streets. What happens on our end is that Street Services does a list, and certain streets are supposed to be done each quarter. DOT have the plans ready and they call it "when a street goes black," you know when the asphalt has gone down and there are no stripes yet, and the idea is that we transition this quickly so that we don't have any collisions out there. But every now and then one street gets elevated out of nowhere, and all of a sudden it is just black. Yes. I've been there many times. But there are bike lanes. Back to 4th street. I'll save the question about the delicate matter of people's opinion about the sharrows for later. I've been going back and forth with some people myself. One of my favorite quotes is "the perfect is the enemy of the good." [Laugh] You've told me that. And or I think General Patton had a variation on it---"A good plan executed now is better than the perfect plan executed next week." Okay, the bicycle boulevard project...does Bikeways have an official opinion on that? The portion of the 4th street project that the Bicycle Coalition is working on? We want to piggyback on the work that the Bike Coalition has done. It is our plan to meet with them and talk to them about the work they have and pick up on that. I think that will be the first Bike Friendly Street that we work on throughout the city. We will have to work on the processes and, you know, it will be a learning experience for our engineers. They haven't ever done anything like this before. Yes.... Although there is plenty of precedent not very far away. The thing I see is if it is just some stripes and pretty signs it really doesn't change anything; it doesn't establish a precedent. Filtration of through traffic is important and beneficial to the neighborhood. A while ago I led a familiarization ride on Fourth Street for stakeholders in the area, and I detoured down to Hudson and Sixth because at Hudson and Sixth there is a traffic diverter. It wasn't put in for bicycle purposes. But they work great for bicycles. Yes. People got tired of cut through traffic in their neighborhood, and I pointed that out and said, "This is the kind of thing that we are talking about. This one has probably been here 30 years. It gives your neighborhood back to you." Everybody was cheering and clapping. Good! Good, that is what we need you folks to do. But what I'm wondering is what DOT's conception of a bicycle boulevard? Does it match what you would see in Berkeley or Portland? Yes and no. The second part of the bicycle plan is the technical design handbook, and it is supposed to have all the solutions for how we can do bikeways and the bike friendly streets--and were calling them "Bike Friendly Streets" here.... Amazingly enough there are folks in the public that don't like bicycle boulevards and they don't want to see them in their neighborhoods. And we have heard from them already. Anyway, we have bike friendly streets, and they fall under the bicycle route, or class three. There are number of treatments that are called out within the document like roundabouts and diverters and median islands. Okay, that is the main thing that I wanted to see because often times there's a disjoint of perception you know. I'm thinking one thing, and some else is thinking that you put up a pretty sign and stripes. Level five is what LACBC is thinking of for Fourth Street. Fourth Street is also low hanging fruit. It doesn't get that much car traffic as it is but it does have a surprising number of accidents for a poky street. Yeah. My understanding is that there is a big collision history out there, and the stop signs were put out there to solve that. My hope is that with the support of the neighborhood, and the work the LACBC is doing out there, a lot of the solutions that we are going to recommend for the area are about to happen as part of that collision history. Now, the DOT, in addition to having all the offices down here and all the folks here [has] a number of divisions, one of which is Geometric Design, and they are the ones doing all the striping in the street. Things like diverters will fall under Civil Design; we partner with the Bureau of Street Services, and they essentially come and work for us and do designs based on what we are proposing in order to move forward. Nonetheless, there are couple of other things I do have concerns about, and we'd like LACBC to move forward with them. I'd like them to be talking to police and fire already about these sorts of solutions. I believe they have been. I haven't, but I think that official members of the LACBC have. I hope so, because historically, not here, but in other agencies, there are histories of police and fire fighting a lot of solutions we are talking about here. The other thing is we want to make sure that things fit from a geometric sort of solution. For instance: for roundabouts you have to have certain roadway widths and you have to be able to do certain things to be able to get those put in place. You have to make sure that it fits into the context. So, I'm hoping that we are able to get everything out there. The first thing for me is I want to flip a lot of those stop signs, but you start flipping those stop signs and then the cut through traffic happens from the cars so all this sort of treatments need to happen too. Let me ask you a question, and we may be going off on a tangent here--I know it is permitted statewide, but I don't know if it is part of the mind set for LA, but: how about four-way yield signs? We have been collecting data... We are doing data collection out there for the sharrows. At each of the intersections I am watching the traffic flow--and, you know, it is kind of hard to figure out who is actually going to stop, or how slowly or quickly they are going to roll it, and you are right. I am seeing a lot of that stuff. So a four-way yield. My theory is that it removes the element of false certainly that the four-way stop gives someone who is planning to run the intersection. It makes everyone at least slow down more significantly. ...and the bikes were in a heap in the middle of the road and these two twentysomething guys were standing there yelling at each other in the intersections. Because, you know the psychology. "Well, the other guy is going to stop at the four-way so I can go through." But if it is a yield sign they say, "Nobody is going to stop." My masters thesis is on a concept of fair play--fair play primarily in an elite sport, but one of my posits is that cheaters always expect that other people will not. Otherwise they are not going to get an advantage. And it's a similar sort of principle. You know... I would like, maybe if that is not in play yet, that through you it could come into play as a potential treatment. You know, I want to get that in here. You might want to comment on the plan, as it is out, that that be something that is included in the technical handbook. I want to get it in here as a tool because we don't have that in here yet. So I just made myself a note to make that recommended. So, in essence, a "Level Five Bicycle Friendly Street" is essentially a classic bicycle boulevard as exemplified in places such as Berkeley and Portland. The interesting thing about Berkeley--and you know that the first one ever was actually in Palo Alto, they were the first bicycle boulevard, and then Portland really jumped on the concept. The Berkeley concept was actually...they had a bunch of traffic diverters in place for years but they didn't make them bike friendly until about ten years ago. They had a grid system that was parallel to some of their major arterial streets that would get backed up going onto campus, and people were cutting into neighborhoods to get to school, so they put up all those traffic diverters for that purpose. Not necessarily for Bike Friendly Streets. A friend of mine did the bike boulevard concept, and did their bike boulevard network, and said, "You know this would be a really easy conversion into a bike boulevard." And that is the way it happened. So they had the network in place already and they didn't have to fight making change. All they had to do is make cuts in the diverters and put people through them. I didn't know that. True, we over treat intersections sometimes. I heard a couple of years ago that a city in Germany was talking about remove all traffic control devices. Yeah, they've done that in a number of places. The one thing they do is establish a statutory speed limit for streets under that treatment that is something like 20 km hr. And it has been quite successful in neighborhood streets. Obviously it is not for arterials. I know that Sacramento has done some calming. They put in some 18mph streets. (And somebody told me that it would be illegal to do that, but I don't know why it would be.) 18 mph, and it is such an arbitrary number that it makes you start thinking, "what is 18 miles an hour?" And that slows you down. The block I live on has full traffic control signals on both ends and it has speed bumps. And people still drive down it at 60 mph. I know...We have spent so much time out on the streets working on the sharrows. And we've been seeing the same people over and over. You notice a car in a small constrained area going 50 or 60 mph, and apparently these are people that live there because they keep coming through. Yeah...that is getting beyond our discussion. The sharrows: got em, everyone started complaining right way. Well, one person started complaining very quickly. Chris [Kidd] referred me to the Manual of Uniform Traffic Control Devices where in fact a minimum of 11 feet from the curb is specified, but who installs things and do they have any discretion at all or are they just following orders. A traffic engineer makes a decision for how they go on the ground because a traffic engineer is ultimately legally responsible for how things go on the ground. No. The individual that puts the paint mark is either a one of the city's crew or a contractor. And it goes the same for any sort of striping. So let me ask you a question because that is something that people are interested in. The traffic engineer doesn't necessarily review each placement but gives a general treatment for the street...or does he or she review each placement, like at that end of the block and at this end of the block there may be different situations. It depends on what we are talking about in this particular study, but let me mention a couple of things first of all this is a study that is not set in stone. We did do a lot of pre-engineering on the study before we moved in and started doing the pre-study and putting the sharrows in and doing the after study. We rode--I rode--all of them. Many of our engineers rode at 11, 12, and 13 feet on bikes. So, each time we went to one of the sites and...trying to determine how we were going to do this and how we were going to implement, it was immediately clear that 11 feet was too close. So we looked at 13 and we looked at 12 and a half, and it depended on the roadway. The conditions are different on each situation and each roadway has very different roadway conditions, and we chose these for a reason: how do people behave, how do the roadway geometrics change things. We settled on 12 for the study for a couple of reasons. On streets like Fountain there are concerns about putting the sharrows out so far that a motorist has to swerve. And they do have to swerve. It is very clear that at 12 feet and 13 a motorist has to leave that travel lane if they want to get around a bicyclist, so we are creating a scenario where they are crossing over the line, and they are going in the other travel lane and crossing back over--and we think that's fine as long as there is enough room to be able to do that. We do have concerns about motorists picking off bicyclists coming the other direction, not seeing that bicyclist at all, that they are so focused on seeing the bicyclist here that they would pick the other one off there. So we are doing the test at 12 feet and will reevaluate. We are also testing materials. We have thermoplastic at most locations; we have locations where we have paint just to see how it wears and whether or not we might consider using paint in some scenarios. We also considered another sort of sprayed on substance. Thermo is usually rolled on or it comes in a vat of hot steaming plastic, then it is rolled on over a stencil or it is actually melted on with kind of a flame thrower. So those are the two different ways you can put it on. [The third option] looks like paint and sprays like paint but really wears well; it is my understanding is that SF has used it. We have been told by our crews and staff here that it is highly toxic. What are the traction characteristics of the various treatments, especially in the rain. There has been some concern about thermo, and I have voiced that in the past to make sure that we get its friction coefficient. I have had experiences on thermo when it is wet; one thermo is slick--my tires have skidded out on it, though I haven't gone down. I know of at least two incidents where bicyclists were killed when they skidded out on thermo. Well that is a big issue then. Though it doesn't rain much here, that makes it more of an issue because, when it does rain people aren't used to it. Right. They place glass beads in it, and we have been very clear with the installation crews that we want more than our share of glass beads on this to make sure it has more friction. They have been very good about doing that. Has anyone tested their coefficient of friction after they've been installed. It might be a good idea. And it would certainly forestall further criticism on that account, or it would indicate something that has to be dealt with. Since this is the pilot now is the time to find out, not when 10,000 have been laid down. Okay, I'm making a note. Especially in the wet. If it is not usable in the rain then everybody has to have a car as a backup anyway, and you don't want to force that. Let's see, what are we down to...six or seven. For a city of this size to really deliver and make bikes a real mode...we are trying to upgrade and retro fit a system on a skeleton crew. Since the mayor [went] down and broke his arm there has been this call to do all this stuff really quickly with this bulk-contract-all-the-services out mentality. You can't just do that. The city's bid process, to keep it fair and keep it open to everybody and to make sure the city gets the best value for its dollar, is really pretty onerous, and making all sure all those things happens requires quite a bit of project management. Our transit group are experts on transit and running a transit line but they do it contractually, and they put all those contracts out and maintain all the contracts. That is where I think we need to aspire to be in the future, so the next few years are going to really tough on the city. I am quite honestly really scared about implementing this new plan and moving into a new land, doing bicycle streets and bicycle boulevards in a city that has never done anything like this, while at the same time trying to figure out if we have enough staff to just keep going with what we have been going with. But I have seen change. Within the last six months we are seeing change. Our general manager is very supportive of bikes, and I know she has been pushing things on her end. She really sees a multitude of modes that have to happen through the city. She knows and has vocally said the city is younger, the city wants changes, and it is our job to provide those changes for the city. So she has been really helpful in getting management to understand we need to make change. You know we are a very big animal, we are the Queen Mary, and we've just begun the turn. Visit LADOT's Bicycle Services Website for more about Los Angeles cycling as seen from the other side of the desk. Many thanks to Gina Morey for transcribing the DVR audio!